SURFIX manufactures a variety of acrylic ballot boxes, donation boxes, suggestion boxes, lead & comment boxes and collection boxes. Acrylic boxes can be customized by adding a business card or brochure pocket or placard holder. If you don't find the exact donation boxes you need, please call or fax us with your specifications. Engraved acrylic cash box. 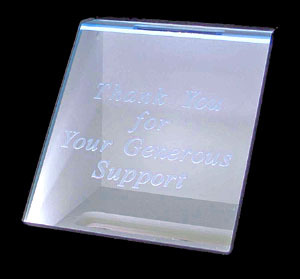 The acrylic face can have your logo, theme or a thank you all etched into the front. Engraved logo or wording on base. You can have your full color logo engraved on the base. It is normally prepared by adding a colored acrylic insert into an engraved pocket; if there is too much detail we can add a vinyl decal. Literature Holder - Permanently secured to either right or left side this pocket will accommodate up to 3/4 inch of literature, brochures or envelopes. Front loading frame (clear anodize) Available in 8.5" x 11" and 11" x 17". Each frame includes an anti-glare protective sheet cover. Just open the 4 sides change the poster and snap shut. Excellent for tailoring the donation box to a current event or for announcing a fund raiser. Double Locks Keyed Differently - Locks keyed differently are available for security. This option requires keys held by two people to open the cash box. Casters -Twin -wheel caster with hood 1 -9/16 nylon wheels. This option allows you to easily move the donation box after the event. Braking casters are also available to avoid unintentional movement. Donation and collection boxes, attractively designed can help your fund raising efforts. Our quality fabrication and eye-appealing materials ensure your donation box will look good and add to the decorum of your facility. For your club, church or any organization we can produce effective donation boxes that get results. Also known as: donation boxes, contribution boxes, counter top boxes, money boxes, suggestion boxes, ballot boxes, acrylic boxes and custom donation box. Acrylic Face: 11" x 12"
QUANITY ORDERING: Please note quantity pricing is for multiples of the same style. They do not have to be shipped to the same destination. 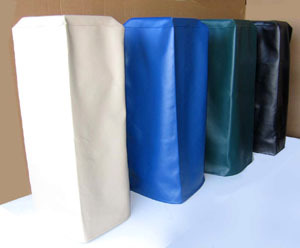 Available in Sand, Pacific Blue, Hunter Green and Black. Scroll to bottom of this page for ordering. The LED light kit is a concealed set of 18 led lights illuminate the edge of the acrylic base. This option is perfect to attract donors from across the room. Effective in both natural and dimly lighted rooms; this option finds the edge of engraved logos or wording to dramatically enhance the appearance and or message. Typically, alkaline batteries will provide more than 21 hours of illumination. The kit must be installed at Surfix and includes: 18 LED lamps, in line toggle switch and a battery clip for 8 AA batteries (batteries not included). The light kit works with 8 standard or rechargeable AA batteries. -Caster (set of 4) 1 1/2"
VL42- Braking Caster (set of 4) 1 1/2"